A classic, versatile, refreshingly cool yogurt based chutney is Kothimira perugu pachadi which works great as a dip, a chutney with dosas, a raita with flavored rice or a simple pachadi with rice. One that can be prepared with effortless ease, a simple combination of fresh coriander, coconut and yogurt and perfectly seasoned with spices that further accentuates the chutney’s distinctive taste. A herby flavor with sweet overtones and green chillis providing a subtle spice kick - a pachadi that is sure to titillate your taste buds. 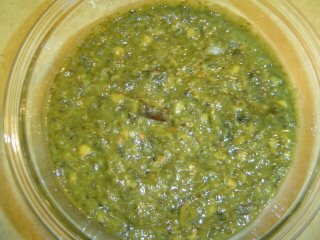 1 Grind fresh coriander leaves, grated coconut, green chillis and salt to a fine paste without adding any water. 2 Transfer the ground paste onto a serving dish and combine with beaten curd. 3 Heat oil in a pan, add mustard seeds and let them pop, add the split gram dal, chana dal and let it turn red. Add the curry leaves, red chillis and asafoetida and toss for a few seconds. Turn off heat and pour over the coriander-curd mixture. Combine. 4 Serve with white rice or rotis. There is nothing more satisfying than cooking with vegetables grown in one’s own backyard. Today I used a few not so ripe orange tinge tomatoes from our vegetable garden to make a perfectly simple pachadi. To make this deliciously tangy pachadi all you need are simple everyday ingredients like fresh firm tomatoes, coriander, green chillis, onion and the all important spice - cumin seeds. Ultimate in simplicity yet flavorful this chutney tastes best with idlis and dosas. The greenish shade of the pachadi is due to coriander which should not be overused and may play a dominant flavor but used subtly to harmonise with the tangy flavor of tomatoes. 1 Heat half a tbsp of oil in a non-stick pan. Add the cumin and let them brown. Add the slit green chillis and saute for a few seconds, add the sliced onion and saute for 4 mts on medium heat. Lastly add the chopped coriander and saute further for a mt. Remove and keep aside. 2 In the same pan, add a tsp of oil, add the chopped tomatoes and on medium flame saute till the rawness of tomato disappears and the water evaporates (approx 4-5 mts). Remove and keep aside. 3 Grind the sauteed onions, coriander, tomato, tamarind along with salt, to a coarse paste adding a few tbsps of water. 5 Heat oil in a pan for the tempering, add the mustard seeds, let them pop and add the split gram dal and curry leaves and fry till the dal turns red. Lastly add the asafoetida and immediately add this seasoning to the ground pachadi. Serve with hot idlis or dosas. My entry to JFI - Tomato hosted by RP of My Workshop and Green Blog Project hosted by Mandira of Ahaar. Thanks RP and Mandira for hosting JFI and Green Blog Project. Ulli chutney, a pleasing blend of sauted onions, tamarind and red chillis, has a perfect balance of sweet, hot and tangy flavors and makes a good and quick chutney with idli and dosa. A simple, healthy chutney that can be made in a jiffy and tastes best when made fresh. 1 Heat one tsp oil in a pan, add cumin seeds, dry red chillis and stir fry for a few seconds. Add urad dal and let it turn light red. Remove from pan and cool. 2 In the same pan, add another tsp oil, add the sliced onions and saute for approx 4-5 mts. Turn off heat and cool. 3 First grind the urad dal, cumin seeds and red chillis till coarse. Add the sauted onions, salt, tamarind and jaggery and grind to make a paste. You can add 2-3 tbsps water for a thinner consistency. 4 Heat oil in pan for seasoning. Add the mustard seeds and let them splutter. Add the curry leaves and turn off heat. Pour over the chutney and serve with idli or dosa. There are numerous ways to prepare Majjiga Pulusu, our Andhra version of Kadhi, a buttermilk based stew. 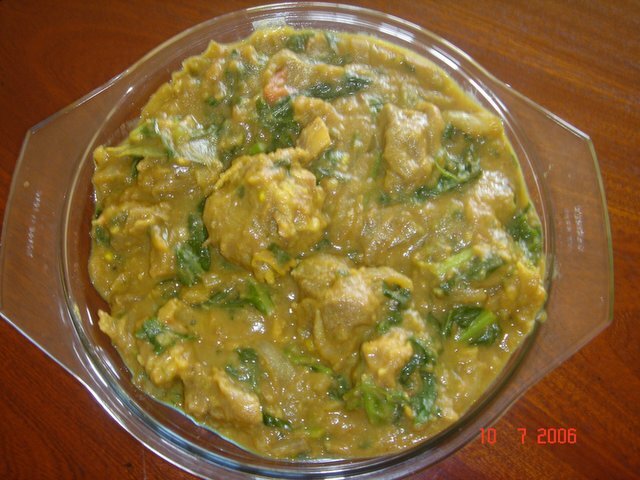 This pale yellow colored stew calls for vegetables cooked in a delectable combination of fresh coconut-green chillis paste and well beaten sour curd. Vegetables like okra, bottle gourd and drumsticks are usually used to prepare this sweet-sour flavored sauce with a tinge of spice that tickles your taste buds, though you could also use sweet potatoes, tomatoes, greens and potatoes. You can tweak this recipe, giving it a herby flavor by adding fresh coriander leaves to the coconut-green chilli paste. You can omit asafoetida and add a crushed garlic in the tempering. Try to limit to two to three varieties of vegetables and not more and use slightly sour curd. Fresh, warm and comforting, a delicious stew. 1 Make a paste of grated coconut, green chillis and coriander leaves without adding any water. 2 Beat the curd well adding water to form a smooth sauce like consistency. 3 Combine the ground paste with the beaten curd and keep aside. 4 Add half a cup of water to the cubed vegetables (1/2 tsp salt) except the onions and cook till they are half-cooked. Keep aside. 5 Heat oil in a pan, add mustard seeds and let them pop, add the cumin seeds, methi seeds and let them turn slightly brown. Add the curry leaves, red chillis and asafoetida, turmeric pwd and toss for a few seconds. Add the onions and saute for 4 mts before adding the cooked vegetables (along with left over water if any) and combine well. 6 Add the curd-coconut mixture to the vegetables and on low heat, cook stirring continuously, otherwise it might curdle. Adjust the salt and cook till the vegetables absorb the flavors and the gravy thickens. Do not boil. Turn off heat. Cover lid and let it sit for a few minutes before serving for the flavors to absorb. 7 Serve with white rice. This is one of my favorite leafy vegetable. I was excited and surprised to see it in the Chinese store. It is used in most eastern and southern Asian cuisines. Typically it has a Long hollow stems, long broad leaf. It is grown in water. 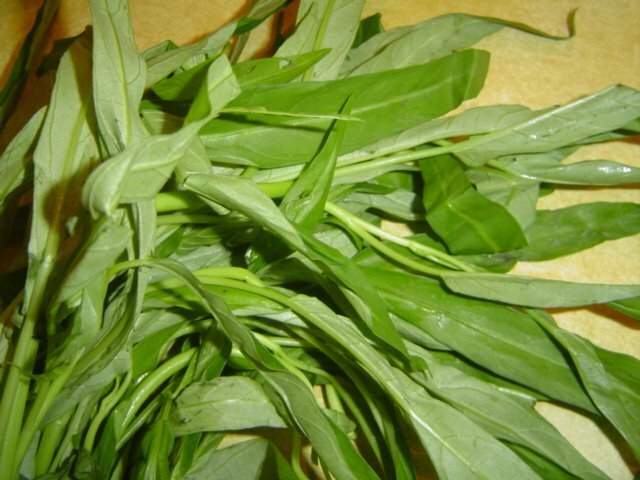 It is also know as water spinach, in Chinese On Choy, Ong Choy and in Telugu (India) Thuti Akkukura. This is a very simple and easy to cook. Separate the leaves and tender stems from the stems. Wash the leaves and drain the water. Chop the leaves. Ingredients to cook: One onion finely chopped, 6 Tbs oil, about 8 red chillis, 1/2 tsp mustard seeds, cumin/jeera seeds/ urad dal. 1/4 tsp turmeric, Salt to taste. Optional to add some whole garlic pods. In a wide pan add the oil, when it is warm add the seasoning. When it splutters, add the chopped onions and garlic and turmeric.Fry till it is golden brown in color. Now add the chopped leaves. Add a little salt, Mix it well. Close the lid for couple of minutes. 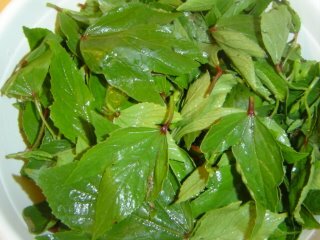 The leaves get cooked and reduce it to half of the quantity. When the leaves are completely cook and if there is some water left, remove the lid and keep it open. Adjust the taste. Let it fry for sometime. Serve with rice or roti. all over the world generally become nostalgic,become emotional...drooling....and tell you about the umpteen recipes that you can churn out of this green leaves with a distinct sour taste....Gongura Pachadi a must in every hosteler's secret pantry, back in AP where I worked....and several of them survived only on the Gongura pachadi when the hostel food became boring for them....Moreover Gongura pappu and gongura pachadi often made appearance in our daily hostel menu...So recently when I had an unexpected encounter with this Telugu beauty, I did not hesitate to pick one bunch...thought of making Gongura pappu or Gongura pachadi, which many of my fellow bloggers have already blogged...My obsession with nonveg dominated,my guilt feeling remained but I ended up cooking something 'to bite and tear'! !...I finally settled with Gongura Mamsam...A mutton curry in Gongura gravy....I wanted to keep the taste quite subtle, so I have not ground it into paste as it is generally done...for I was not sure whether my husband would really give a nod for it....and hence the colour is a bit less green as against the usual.So here's my recipe for Gongura Mamsam. Similarly you can make Gongura Chicken,which, again is a hot favourite in Andhra Non veg menu. Cook Mutton with half the quantity green chillies, ginger garlic paste,turmeric powder,chilli powder and salt along with potato cubes.Keep it aside. (I pressure cooked it with some water).Now heat oil in a pan.Add curry leaves, bay leaves, cinnamon, cardamom,cloves,star anise.Saute it for a couple of minutes.Add the onion pieces& tomato and saute it till it becomes transluscent.Add the ginger-garlic paste to it and fry till golden brown.Meanwhile cook 'gongura' leaves and chillies separately and grind it to a paste and keep it ready. (I did not grind for I didnt wish the flavour to dominate too much).Add the cooked mutton pieces and salt to it. Add all the powders to the mutton and finally, add the gongura paste and allow it to cook for 4 minutes. Serve it hot with hot rice and drizzle of ghee....Beware!You wouldnt know the rice vanishing from your plate,but the stomach will tell u!! 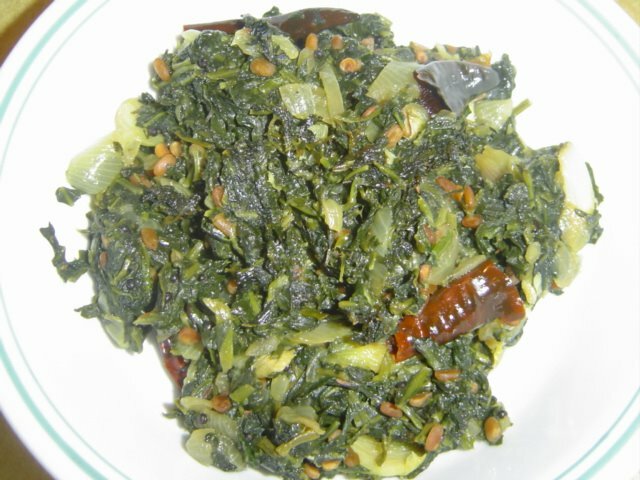 Fresh leaves of gongura cooked with dal. 1.Clean gongura leaves. Seperate the leaves from the stems. Wash the leaves in water. Drain the water. 2.Take a pan and put 5 teaspoons of oil. When the oil gets warm. Put the Gongura leaves in the oil also add some salt to it. Keep frying it till the leaves get cooked and reduce to a small quantity. 3. Let the leaves cool down. Grind the leaves to a paste. 4. Cook 1 cup toordal and 1/4 cup channa dal and keep it asside. (Mustard seeds, Jeera, Red chilies, Hing). Let the mustard seeds splutter in oil and then add oions, green chilies and curryleaves. Add some turmeric and salt. and fry it till its cooked and golden brown. Later, add this to the cooked dal along with the paste of the gongura leaves. Stir the whole mixture. Let dal boil for sometime with all the poppu and gongura leaves paste. 6. It ready to eat. 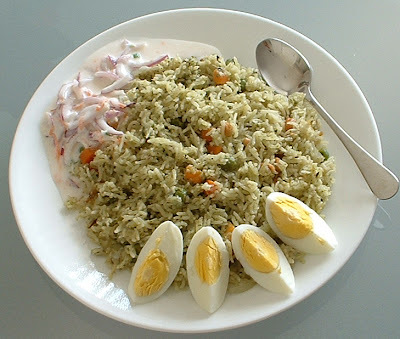 Serve with rice or roti!!!. It's yummy and mouth watering. Grind mint, chillies, coconut and make into paste. Heat oil in a pan and fry cardamom, cloves and cinnamon. Saute onions in that till they turn transparent. Add the mint paste, peas & carrots and fry till all the ingredients mix well. Add rice & saute for few more minutes. Now pour coconut milk & water into the pan and bring it to boil. Add salt and cook in Rice Cooker. When rice is done, just stir it once with fork and add fried cashews and close it with lid for about 2 mins. Delicious Mint rice is ready..! U can serve with Raitha..! Seo Art blog Bali blog Flower Blog EatonWeb Blog Directory Total Blog Directory The India Forums Dmegs Web Directory Blogs Directory GetBlogs Blog Directory Add New Products Free! EasyHits4U.com - Your Free Traffic Exchange Hotel Reviews Blog Directory Submission Buzzer Hut | Promote Your Blog Go BlogZ A Blogin Blog Directory Blogoriffic.com Website Designing India Link Exchange Free UK Directories business brokers business for sale Radiology Schools Add URL Link Exchange Directory Search Engine Optimization Tools Consolidate Debt With a Home Equity Loan Website Designing India World Business Directory_worlddirectory.com Poker bonus - Cash your bonus!